How do I adjust the shoulder straps on the SKIP? How do I recline the SKIP Seat? Can I attach the Buggyboard to the SKIP? How does the SKIP fold? What accessories can I buy for the SKIP? Are accessories transferable between the SKIP and JIVE²/METRO²? What colours does the SKIP come in? How much does the SKIP weigh? Does the SKIP have an extended canopy? Is the SKIP suitable from birth/ for newborns? 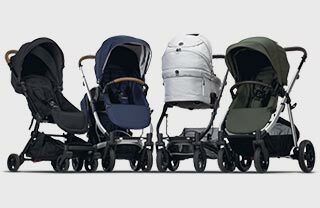 The SKIP is designed as the perfect second stroller. As the SKIP can be used in a fully reclined position, when using the SKIP for a newborn, we strongly recommend adding the SKIP Seat Liner and SKIP Infant Head Pillow for extra comfort and support. The seat is attached to the chassis and cannot be reversed, and there is no Bassinet attachment for SKIP. Up to what age will my child fit into the SKIP? Can I take the SKIP onboard an airplane? Is the seat on the SKIP reversible or replaceable?